Pregnancy and new motherhood are often thought of as the most joyful, exciting, and blissful times in your life––but they can also be difficult and overwhelming. Yoga therapy offers practical mind-body tools (simple breath, movement, and mindfulness practices) to support you and provide solace, steadiness, and ease in difficult times. Perinatal mood and anxiety disorders (PMADs) are the number one “complication” of birth. They affect not just moms who suffer, but also the families who care about and rely on those moms. More than twice as many moms suffer from PMADs as gestational diabetes. Yet while robust support and treatment options exist for diabetes, moms who suffer emotionally are rarely acknowledged. Instead of receiving help, they are handed platitudes like “Sleep when the baby sleeps,” “Let go of stress because it’s bad for the baby,” or “Just enjoy every minute because it goes by so fast.” This can be a lonely and confusing place to be—suffering profound fear or sadness at a time when your friends and family expect you to be happy, radiant, and beatifically calm. 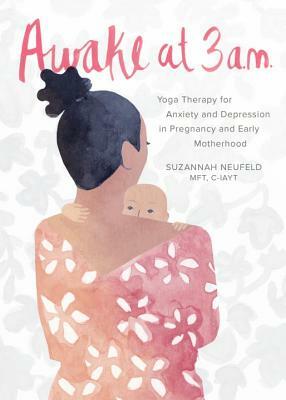 As a therapist supporting women's mental health and those recovering from perinatal mood disorders and trauma since 2003, Suzannah Neufeld is keenly aware of the special needs of women during pregnancy and the first year of motherhood. Synthesizing modern psychotherapeutic research with practical yoga therapy, Neufeld offers a compassionate, acceptance-based approach that meets women (and their partners) wherever they are. Awake at 3 a.m. contains short, digestible chapters that are perfect for when you are feeling exhausted or overwhelmed. Neufeld skillfully dismantles the myths and internal beliefs that contribute to the suffering of new mothers, and tells her own story with honesty and humor. The yoga practices are designed to fit into your life as it is now––no flexibility, mat, special clothes, or 90-minute yoga class required. Suzannah Neufeld, MFT, C-IAYT, is a licensed psychotherapist, certified yoga therapist, and mother of two who has specialized in supporting people coping with eating disorders, body image concerns, anxiety, and pregnancy and early parenthood since 2003. She is a co-founder of Rockridge Wellness Center, a counseling and health collective in Oakland, CA, where she has a private practice and leads yoga therapy workshops. Awake at 3 a.m. is her first book.